We are digitizing the entire collection of Living in Western Pennsylvania by year; this group is online, http://bradystewartphoto.photoshelter.com/gallery-list. Gallery: Living In Western Pennsylvania 1900-1910. We added 10 new images of the Pittsburgh Skyline. The images feature four (4) of the new buildings constructed since the turn of the century; the Frick Building, the Arrott Building, the Farmers Bank Building and the Bessemer Building. The funding for this metamorphosis came from three of the city’s wealthiest residents; Henry Clay Frick, Henry W. Phipps, and Henry W. Oliver. View of the Pittsburgh Skyline from the roof of the Empire Building on Liberty Avenue. View of the Bessemer Building in Pittsburgh under construction. Image was taken from the roof of the Empire Building on Liberty Avenue. We added seven (7) new images of Pittsburgh from Mt. Washington. The views provide a better view of the coal barges on the Monongahela, Point Buildings, the new Wabash Bridge, Terminal and Office Building, the financial district skyline, uptown view of Duquesne College and the P&LE Railroad station and yard on the south side. The next Post will summarize the balance of the negatives and prints digitized to complete “Living in Western Pennsylvania 1900-1910. A reminder that the new images can be found at http://bradystewartphoto.photoshelter.com/gallery-list. Gallery: Living In Western Pennsylvania 1900-1910. And that the images online are for sale and all proceeds are used to digitize and identify more prints and negatives. Filed under Brady Stewart Studio Inc.
As discussed in the previous blog, we are digitizing the entire collection of Living in Western Pennsylvania by year; this group is online, http://bradystewartphoto.photoshelter.com/gallery-list. Gallery: Living In Western Pennsylvania 1900-1910. The Boy’s Brigade uniforms from the beginning had a military look since it reflected the military approach of the organization which stressed drill and discipline. The new images include Brady Stewart and members of the McKeesport Boy’s Brigade, participating in the 40th Anniversary of the Battle of Gettysburg. The images also include members of the Pennsylvania National Guard along with Troop F of the 15th US Cavalry Unit. 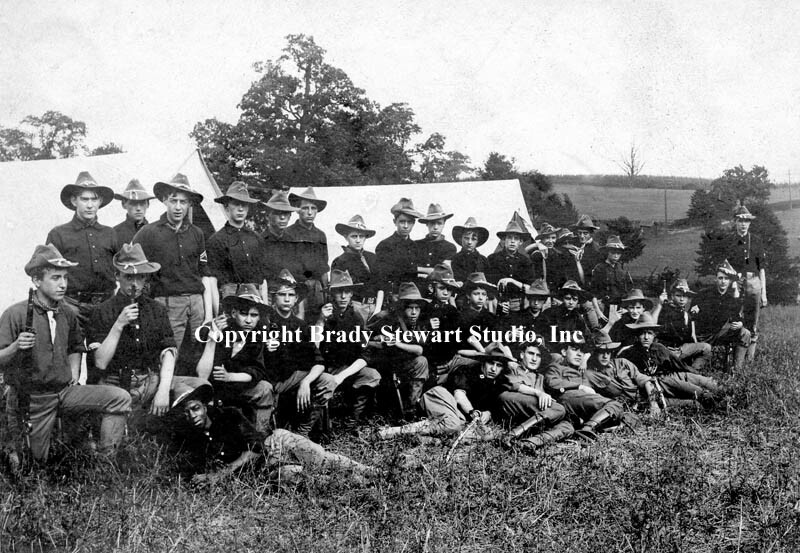 There are a total of 13 new Boy’s Brigade / Gettysburg images online now and can be viewed at http://bradystewartphoto.photoshelter.com/gallery-list. Gallery: Living in Western Pennsylvania 1900-1910. The next post will include new images of members of the Fort Pitt Masonic Lodge marching in the annual St Patrick’s Day Parade in Pittsburgh 1903. We added two new images of Westmoreland County Coal Company and eight (8) Pittsburgh and Pennsylvania maps from 1750 to 1865. And a reminder that all the images online are for sale and all proceeds are used to digitize and identify more prints and negatives. What comprised a Commercial Photography Studio during the 1950’s and 1960’s?